PROVIDENCE — The American Chemistry Council, a lobbying group for chemical companies, and some environmental groups praised the recent nomination to head the chemical and pollution office at the Environmental Protection Agency (EPA). Before assuming the high-ranking post, Alexandra Dapolito Dunn must be confirmed by the Senate. Dunn was appointed to her current role as head of the EPA New England region by disgraced former EPA head Scott Pruitt. She has served at the post for less than nine months. Dunn is considered a moderate based on her work to pass chemical-safety legislation, but she also supported Pruitt’s decision to dismantle former President Barack Obama’s greenhouse gas emission-reduction plans. She also favored Pruitt’s changes to EPA advisory boards. At a recent business forum in Providence, Dunn explained how she would manage the growing influence of the chemical industry and other polluters that are taking jobs at the EPA. Dunn’s top goal, she said repeatedly, is to provide regulatory certainty to industry and the public. “It’s that whole sense of not being accountable for the work, is really being pushed hard as a way of transforming government and specifically transforming the EPA,” she said. Dunn also pledged to issue pollution permits more quickly, create a “new level of transparency” at the EPA, and to make employees more accountable. The message of regulatory certainty is pushed by business groups, but the concept conflicts with Dunn’s belief that states should be given more say in establishing regulations and with efforts by the EPA and the Trump administration to prevent California from implementing stricter pollution regulations. Dunn lumped offshore drilling and offshore wind energy under the topic of coastal development, as an issue that New England should be concerned about. Dunn said the rollback of the Clean Power Plan doesn’t impact New England because of rules in place through the multistate emission-reduction program known as the Regional Greenhouse Gas Initiative (RGGI). However, she didn’t explain how RGGI protects the Northeast from the impacts of climate change and from air pollution from Midwest states. “The Clean Power Plan was never a threat to New England states because of RGGI, so that rollback is not going to dramatically affect the New England states,” Dunn said. 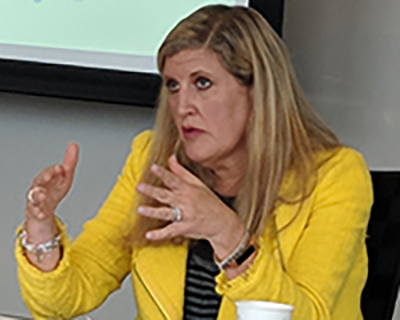 Janet Coit, director of the Rhode Island Department of Environmental Management, endorsed Dunn for the promotion and praised her for her work to reform the Toxic Substances Control Act in 2016. Under Coit’s tenure, DEM has also cut the time for issuing permits, while making the agency more business friendly. Coit also praised Dunn for her work at the Environmental Council of States and highlighted her attention to environmental justice issues. Dunn noted that many states outside of New England need convincing about the need for environmental protections. “It’s not a question of whether to protect the environment but how to protect it,” Dunn said. Key issues in her new post, should she be confirmed, will be replacing lead water pipes, brownfield development, and the remediation of Superfund sites such as Centerdale Manor in North Providence. Dunn also announced that Rhode Island will received $21 million for infrastructure funding. She said to expect an announcement about a multiagency plan to address lead pipe abatement. New asbestos regulations by the Trump administration, Dunn explained, are not a “green light” to expand the use of the hazardous material in the United State, but rather a first for defining the few uses for the substance. “The law reflects a fairly healthy balance between pressure on the EPA to move, move, move and opportunity for states to step in [and reduce the time] that it takes for EPA to act,” Dunn said. Climate-change adaptation Dunn said is largely a state and local issue. Dunn didn’t address the debate over controversial chemicals such as glyphosate but responded to a questions about the increasing influence of chemical companies at the EPA. In addition to the endorsement from Coit, Dunn was endorsed by state environmental heads in Connecticut, New Hampshire, and Vermont. The Connecticut River Conservancy also endorsed her for the new EPA job in Washington, D.C. The Environmental Working Group said Dunn shouldn’t be confirmed until she commits to banning chemical such as methylene chloride and chlorpyrifos and pledges to reverses other recent deregulation.